A New Wine, a Busy Week, and Good Night! The school play opened this Friday, which means this entire past week has been tech week. I have seen my 14 and (nearly) 18 year olds for a total of 10 minutes in the morning and another 10-20 at night, and hardly any time all day Saturday. I did have something new to blog about on Friday and today, but didn’t get around to writing up either post because of the ridiculous schedule the family has kept for the past week. The only thing I was up to putting out to the blogosphere is the new wine I popped open right now. This is from one of the bottles we won in the school’s raffle last month. It is nice, but I think it needs more time in the bottle. 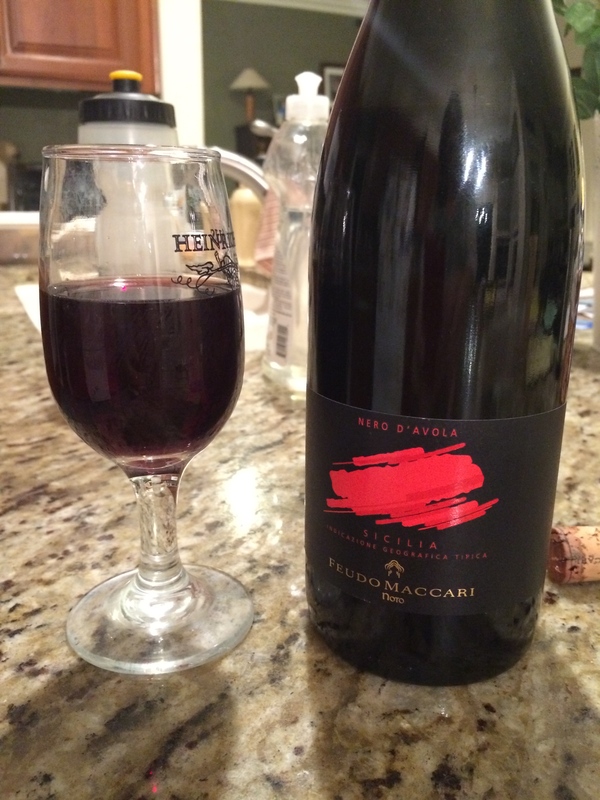 If anyone knows about Sicilian red “Feudo Maccari Nero d’Avola,” please share! This is a beautiful garnet colored red Italian table wine. Fruity but on the dry side, it will do nicely to help lull me to sleep after a busy, busy week. Previous Previous post: Purple Artichokes? Interesting, but How Do They Taste? Next Next post: Big Goal Reached- First 5K is the Hot Chocolate Run!